Summer Weddings - Strategies to Beat the Heat — Sweetchic Events, Inc. Couples love to give their Wedding Party the classic Chicago Trolley experience while taking photos around the city, but many trollies are not equipped with air conditioning. 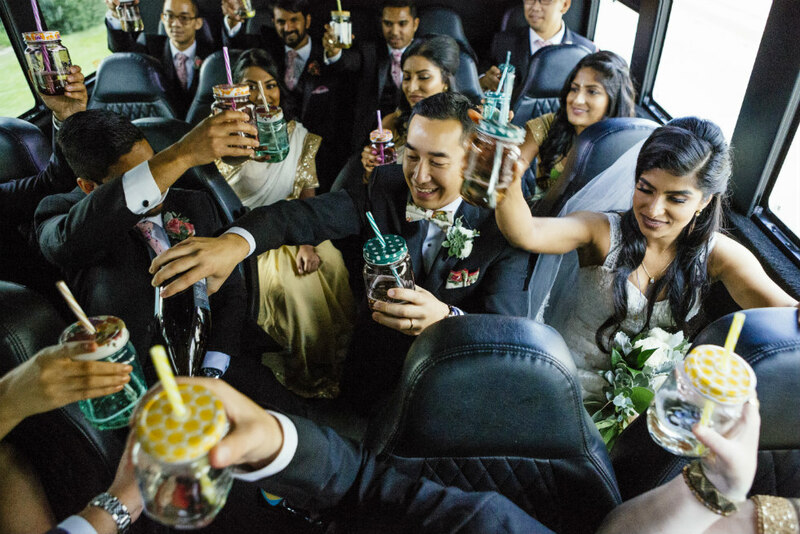 A mini-bus will always have A.C., which is such a relief for your Wedding Party to come back to after taking photos outside. No one wants to be sweating all day long, and it's easy to overheat in tuxes and long dresses. If you must hire a trolley, please check with the company that ALL their trolleys have A.C. PRO TIP: Don't forget to account space for your photographers, videographers, and wedding coordinators when selecting transportation. A little extra space goes a long way, especially on a hot, humid day when close quarters are less than desirable! We hate to sound like a Debbie Downer over here, but the smartest thing you can do is to stock your transportation with a cooler of water bottles instead of booze. Keep yourself and your party hydrated, and no one will topple over during the ceremony! We're totally serious about that one. PRO TIP: some transportation companies may require a security guard ON the Party Bus with you if you plan to have alcohol, so be sure to check with them about their rules! If you're checking the weather the week of the wedding and notice it's going to be steamy or there's a chance of showers, be open minded! Realize that your outdoor photos may get cut short, and then opt for some photos inside your venue, if possible. Don't make your Wedding Party stand outside for hours fake smiling because you have to have skyline photos. Same goes for having your heart set on an outdoor wedding. If any part of the wedding is supposed to be outside and it's a 'feels like' temp of over 85 degrees, please don't make your guests endure the heat. Especially if you have elderly or younger kids in attendance. Of course, your Planner will be there to give advice and implement Plan B! Bonus For Your Guests: Even if it's a milder sunny day, offering your guests yummy beverages pre-ceremony is a refreshing treat!